General Information: The tomatillo, Physalis ixocarpa, also known as: Husk Tomato, Miltomate and Mexican Green Tomato, is a two-celled rounded berry enclosed in the thin husk of it's extended calyx. 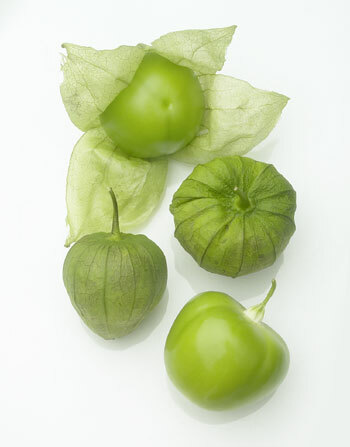 Native to Mexico, the tomatillo was used by the Aztecs. This perennial, often grown as an annual, is usually sprawling and in need of support. It can reach up to 3 to 4-feet tall and from 3 to 4 feet across. The green, yellow-green or purple fruit completely fill the lantern looking husk. The fruit which grows 1 to 2 inches in diameter is smooth and sticky under it's husk. Raw tomatillos have a zesty tart flavor that develop an herbal lemon flavor when cooked. The flesh is solid and seedy. Tomatillos are used in many Mexican recipes, raw or cooked: salsas, gazpacho, and guacamole often call for tomatillo as a prime ingredient. Its flavor is enhanced when baked, roasted or simmered. A good source of vitamin C.